A single-slot module that resides in a Modicon TSX Quantum PLC rack; can be local, remote or DIO rack. Lets you connect up to 63 slave devices. Communicates directly with the PLC’s backplane using 8 or 32 input and output registers. DeviceNet time can be saved by not transferring I/O values unless a change-of-state (COS) has occurred. DeviceNet transfer of I/O data can be scheduled (cyclic data). Information exchanged includes: device I/O data, status information, and configuration data. The DeviceNet network is a cost-effective solution to low-level device networking. Components designed to be used on the DeviceNet network have more intelligence embedded in them than “ordinary” components, making production data readily available to plant personnel and management, when needed. Keeping your production up and running with minimal unplanned downtime is critical to your profitability. DeviceNet components allow for data and status information exchange between networked devices. This provides faster response, greater determinism, and increased flexibility/optimization—all yielding higher productivity. Intelligent DeviceNet components bring diagnostics—including predictive failure down to the sensor/actuator level. No longer do you need to laboriously test all the sensors or actuators to know what failed, and where it is. How does the DeviceNet Scanner communicate with the various components on the network? Peer-to-Peer with Multi-Cast: Peer-to-peer networks are generally token-pass networks. Each device can send messaged only when it has the token. The token gets passed based on the node number (round robin) or possibly via a user-defined priority list. There is no sense of mastership or priority and it is not deterministic. The Multi-Cast feature allows one-to-many and many-toone relationships to be built dynamically. Multi-Master with Multi-Cast: This is where more than one unit acts as a master. Master/Slave Special Case: This is “polled” or “change-of-state” (exception-based). Rather than a Master going through a polling list (scanning), DeviceNet sensors/actuators report data (input or output) on a change-of-state (COS) basis as the events occur. This method is considered more efficient for discrete applications. What sort of I/O Data Exchange does DeviceNet support? The DeviceNet scanner communicates with the Modicon TSX Quantum PLC processor via discrete and block transfers over the backplane. A DeviceNet product may behave as a client, server, or both. The scanner communicates with the scanned devices via strobe, polled, change-of-state, and cyclic messages. It uses these messages to solicit data from or to deliver data to each device on the network. Data received from the devices, or input data, is organized by the scanner and made available to the PLC processor. 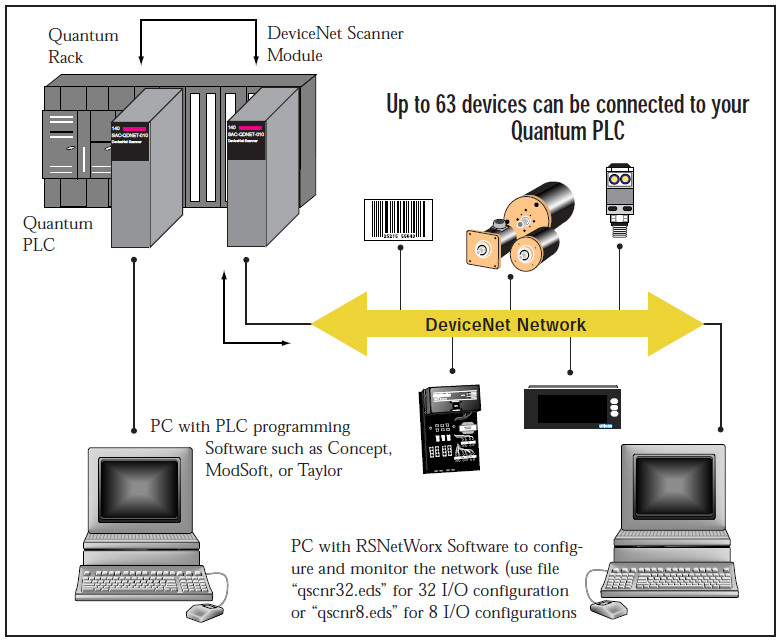 Data received from the PLC processor, or output data, is organized in the scanner and sent on to the network devices. Strobed: Multi-cast message starts the scan cycle. Strobable slaves respond, based on their latency. out even as strobe responses are being received, as bandwidth allows. data production is considered more efficient for applications with slowly changing analog I/O. since only data changes are transmitted. It can be used along with Poll or Strobe. DeviceNet Scanner...The Power of one! AVG Automation’s DeviceNet Scanner lets you connect a wide variety of industrial devices, such as limit switches, photoelectric sensors, proximity sensors, valve manifolds, motor starters, process sensors, bar code readers, variable-frequency drives, panel displays, and operator interfaces from over 150 manufacturers world-wide, directly to your Modicon TSX Quantum PLC. Simpler wiring saves installation/maintenance/repair costs. The DeviceNet Scanner knows what’s connected, and where. Each component on the DeviceNet has its own unique address that can’t be used by any other on the network. All communications occurs on a single DeviceNet cable. Instead of the discrete wiring from your PLC to each sensor or actuator in your application, with DeviceNet, adding or removing a component is simplicity itself. Just “tee off ” from the cable wherever you need to install a sensor or actuator, drop a line, and you’re running. This all adds up to reduced wiring costs and a quicker installation. Need to remove a component? Just disconnect it. DeviceNet doesn’t have to be “taken down” to change.